Stock # UF578515, Turbocharged Diesel V8 6.6L/403, Automatic, 98806 mi. JUST REPRICED FROM $44,995, $3,100 below NADA Retail! CARFAX 1-Owner. 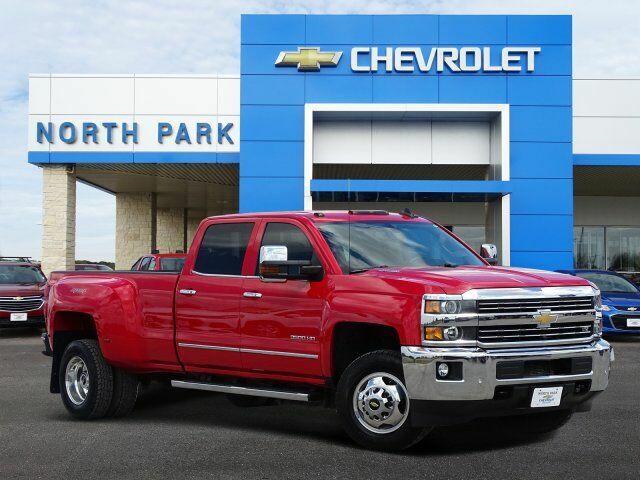 Heated Leather Seats, Tow Hitch, ENGINE, DURAMAX 6.6L TURBO DIESEL V8, B20-DIESEL COMPATIBLE, Turbo, Onboard Communications System, Back-Up Camera, 4x4 CLICK NOW! 4x4, Back-Up Camera, Onboard Communications System. ENGINE, DURAMAX 6.6L TURBO DIESEL V8, B20-DIESEL COMPATIBLE (397 hp [296.0 kW] @ 3000 rpm, 765 lb-ft of torque [1032.8 N-m] @ 1600 rpm), TRANSMISSION, ALLISON 1000 6-SPEED AUTOMATIC, ELECTRONICALLY CONTROLLED with overdrive, electronic engine grade braking and tow/haul mode, LTZ PLUS PACKAGE includes (JF4) power adjustable pedals, (UQA) Bose premium audio system and (UD5) Front and Rear Park Assist. WHEELS, 17" (45.7 CM) FORGED POLISHED ALUMINUM includes 17"steel spare wheel. Spare not included with (ZW9) pickup box delete unless a spare tire is ordered. CHEVROLET MYLINK AUDIO SYSTEM, 8" DIAGONAL COLOR TOUCH NAVIGATION WITH AM/FM/SIRIUSXM USB ports, auxiliary jack, SD card slot, Bluetooth streaming audio for music and most phones, hands-free smartphone integration, Pandora Internet radio, voice-activated technology for radio and phone, and 4 customizable themes, SEATS, FRONT FULL-FEATURE LEATHER-APPOINTED BUCKET WITH (KA1) HEATED SEAT CUSHIONS AND SEAT BACKS. Includes 10-way power driver and front passenger seat adjusters, including 2-way power lumbar control Keyless Entry, Privacy Glass, Steering Wheel Controls, Alarm, Heated Mirrors, Electronic Stability Control, Electrochromic rearview mirror. WHEELS, 17" (45.7 CM) FORGED POLISHED ALUMINUM includes 17"steel spare wheel. Spare not included with (ZW9) pickup box delete unless a spare tire is ordered.